NEW YORK A Boeing (BA) plan to redesign the 787 Dreamliner's fire-prone lithium-ion batteries won approval Tuesday from the Federal Aviation Administration, which also required extensive testing before it would allow the planes to fly passengers again. The plan includes a redesign of the internal battery components to minimize the possibility of short-circuiting, which can lead to overheating and cause a fire. Among the changes are better insulation of the battery's eight cells and the addition of a new containment and venting system, said the FAA in a statement. A series of tests, including flight tests, must be passed before the 787 can return to service. 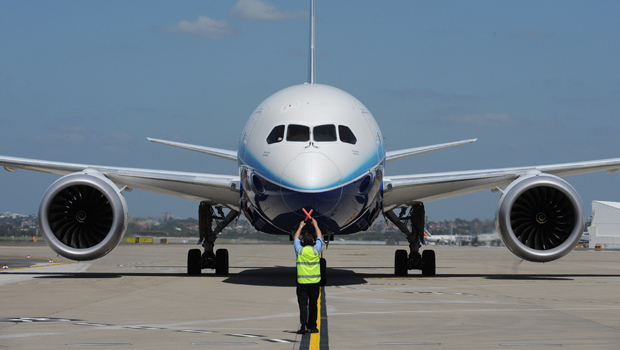 So far, two flight tests of 787s with prototypes of the new battery design have been approved, said the agency. The plan is an outline for a complete recertification of the plane's batteries. The 787 has two identical lithium-ion batteries, one of which is located toward the front of the plane and powers cockpit electrical systems, the other toward the rear and used to start an auxiliary power unit while the plane is on the ground, among other functions. Every item that is part of an airplane, down to its nuts and bolts, must be certified as safe before FAA approves that type of plane as safe for flight. The 787 fleet worldwide has been grounded by the FAA and civil aviation authorities in other countries since Jan. 16, following a battery fire on a Dreamliner parked in Boston and a smoking battery that led to the emergency landing of other 787 in Japan. "This comprehensive series of tests will show us whether the proposed battery improvements will work as designed," said Transportation Secretary Ray LaHood in a statement. "We won't allow the plane to return to service unless we're satisfied that the new design ensures the safety of the aircraft and its passengers." The FAA's approval of Boeing's battery plan "is a critical and welcome milestone toward getting the fleet flying again and continuing to deliver on the promise of the 787," Jim McNerney, the aircraft maker's CEO, said in a statement.